Its summertime and the cubs of Bear Country School are thrilled when Madame Bearsaud proposes to open her world-famous wax museum in Beartown. But some of the elder bears, especially Gramps, are skeptical of the change and long for the good old days. When a diamond necklace is stolen during opening night, it seems as if the anxious bears were right to worry. And its up to the cubs to use their detective skills to find the thief. . . .
Stan Berenstain (19232005) and Jan Berenstain (19232012) were a husband-and-wife cartooning team best known for creating the internationally beloved Berenstain Bears. Both born in Philadelphia, they met on the first day of art school, and were married after World War II. Inspired by their childrens love for Dr. Seuss, the Berenstains created a cartoon version of their own family, and with The Big Honey Hunt (1962) began a series that would stretch to more than two hundred volumes. Starring Papa Bear, Mama Bear, Sister Bear, and Brother Bear, the books quickly became popular for their evocative drawings and simple explanations of wholesome themes. The stories sold more than 200 million copies worldwide and have been adapted as movies, television shows, and amusement park attractions. The Berenstains younger son, Mike, has overseen the series since his parents passed away, ensuring that it will continue to be popular with each new generation of young readers. 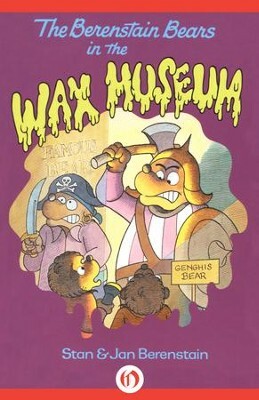 I'm the author/artist and I want to review The Berenstain Bears in the Wax Museum - eBook.